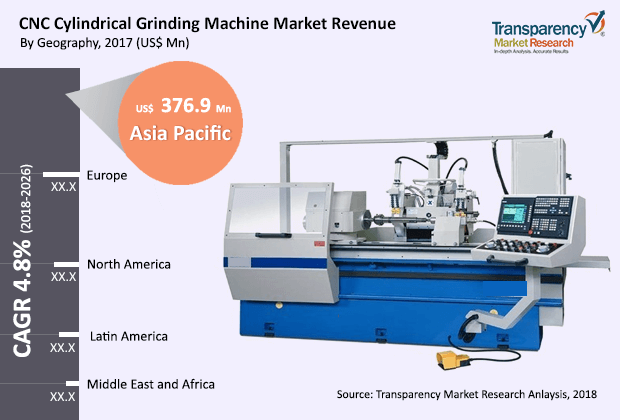 According to a new market report published by Transparency Market Research titled CNC Cylindrical Grinding Machine the global CNC cylindrical grinding machine market is expected to reach value of US$ 1,536.1 Mn by 2026. The market is estimated to expand at a CAGR of 4.8% during the forecast period i.e. from 2018 to 2026. Asia Pacific dominated the global market in 2017, owing to rapid adoption of CNC cylindrical grinding machines by consumers in the region. With the advent of new technologies and continuous growth of the manufacturing industry, the demand for CNC cylindrical grinding machines has risen across the globe. There is a rapid increase in the demand for high-speed and powerful grinding machines that can raise the efficiency. The CNC technology focuses on enhancing the quality and efficiency of cylindrical surface grinding processes. For instance, it provides better repeatability and accessibility, added versatility, and higher control on processes. Increase in the competition in recent years has resulted in manufacturers trying to understand the customer requirements so as to provide them with the best product offerings. In such cases, companies need to manufacture customized products. Additionally, rise in the demand for customized products from consumers is projected to promote growth of the CNC cylindrical grinding machine market during the forecast period. A CNC cylindrical grinding machine can easily manufacture customized products once they are programmed. The same design can be manufactured with better accuracy compared to the manual form of manufacturing. Among regions, Asia Pacific held the largest share of the global CNC cylindrical grinding machine market in 2017. Increasing disposable income in Asia Pacific have raised the sale of these machines in recent years. With the adoption of CNC machines, the machine tools industry in India is expected to witness promising growth in the near future. The machine tools sector in the country has immense growth potential led by increasing investments by MSMEs as well as large-scale companies. The CNC universal cylindrical grinding machine segment dominated the market in China in 2017, owing to high efficiency and accuracy offered by this type of machines. These machines provide a better lubrication system and maximum wear resistance. Rapid customization has also augmented the demand for CNC universal cylindrical grinding machines in the last few years. North America and Europe also hold a significant market share owing to the rise in technological advancements and increase in adoption of CNC cylindrical grinding machines in these regions over the years. Additionally, high demand for production of bulk quantities in order to meet higher requirements of customers has also boosted the demand for CNC cylindrical grinding machines. The market in other regions such as Middle East & Africa (MEA) and Latin America are expected to witness rapid growth during the forecast period. The report also provides the company market share analysis of key players operating in the global CNC cylindrical grinding machine market. Some of the key market players are Janinher Machine Co. Ltd., SuperTech Machinery Inc., Hardinge Group, Shanghai Machine Tool Works Ltd. (Ecotech Machinery), Robi Group Srl, Korber Group (United Grinding), L. Kellenberger & Co. Ag, Palmary Machinery Co., Ltd., and Jetkt Corporation. Key players operating in the global CNC cylindrical grinding machine market have adopted various strategies to sustain in the market. Development of new products, acquisitions, and partnerships are some of the strategies adopted by key players to gain a competitive advantage in the market.